We had a really fun opportunity the other day to meet Megan Roosevelt of Healthy Grocery Girl and enjoy goodnessknows snack bars, while dining at Jamison, as we talked about food and healthy eating. Our time did not allow us to join in on a bike ride, but we still had a great time meeting and eating. Megan’s business offers many different services that you can take advantage of. She will shop for you, shop and cook for you or just teach you ways to eat and shop healthier on your own. You can check out her website for more info. We were also treated to some great snacks by goodnesknow. Each pack comes in a 4-square serving with 150 calories AND with no artificial colors, flavors or preservatives. 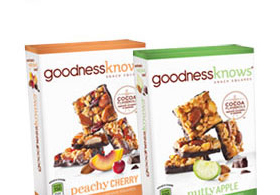 Every serving of goodnessknows® snack squares puts good food into a convenient form you can enjoy anywhere. Visit goodnessknows.com for additional information, including product nutritional content and ingredients. For any of you that know me, I do love to eat, but I do try and eat healthy. I enjoy real food, give me veggies any day. So spending some time talking with Megan was very fun for me. I not only love to eat out, but I love to cook, so I am always looking for recipes and suggestion. Thanks Megan and goodnessknows for the day of treats and info. Thank you for the blog post! It was wonderful to meet with you both as well and so happy you could dine with us at the Jamison!